Mums and Garters are the pinnacle of Homecoming Season in Texas and surrounding states. One of the biggest question parents ask every year about Texas Mums is, make one or buy one? Cheaper to make one? Depends. Cheaper to buy one? That depends too. So what’s a parent to do? If you’re a first timer you’re probably wondering where to start. First let’s start by answering the 5 Q’s? When do I need one by? Mums and Garters for homecoming- What’s the deal? Let’s begin! A mum is a homecoming tradition done by most high schools in Texas and surrounding states. It’s a very large corsage that is worn around the neck or chest for girls or on the upper arm for boys called mum garters. The mum is worn to school on homecoming day, at the homecoming parade, at the football game, and sometimes to a homecoming dance. Then kept on the wall till next year when it’s time to get another. A mum is bought by a date or the parents of the student. You can buy one or make one yourself. If you need someone to make one for you there are professional mum makers that would be happy to help you. 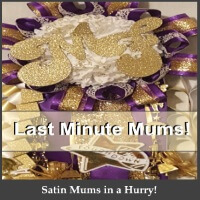 We at Mums and Kisses make lots of Homecoming Mums or you can browse google and choose a mum maker to make a mum for your child. They’ll need to know your child’s grade, what they’re into at school like baseball, tennis, band etc. And you’ll want to set a budget. Whether you’re making one yourself or having one made you’ll want to have a budget. Mums can range in price from about $75 – $350 and up depending on what you want. We know what you’re thinking, HOW MUCH? Yeah we get it. It costs about $150-$400 for the supplies to make one on own. A word of caution. The pre-made mums and garters for homecoming sold in craft and grocery stores are NOT a finished product and if you purchase one thinking you’re good, your child will be shocked when they get to school in their basic mum. These premade mums are not a finished product, they’re not decorated. They’re meant to be a base to be decorated after purchase including their name, their activity, their school ribbon, homecoming loops braids specialty ribbon etc. This is where the cost comes in. The premades may seem cool at $40 or so, but the decor is what makes a mum a mum. It’s like buying a birthday cake for a birthday party that your whole school is invited to and making a box cake with no icing. Are you going to make a box cake and call it done? Or are you going to icing it and write on it, or order one from the bakery? 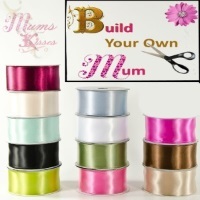 The choice is up to you and what type of mum you or your child would like to have. Many seasoned parents that have “been there done that” start budgeting for mums and looking around in July before school starts. Mums and garters for homecoming are a big deal to most high schoolers. They show not only their school spirit but their personality. There are even mum contests in many schools. And if your child is on a cheer squad or makes the homecoming court. All bets are off! You’ll want the very best! Boys wear them too. Garters are very popular in most schools and are bought by the date or the parents of the boy. This tradition is over 100 years old and very prominent in Texas High Schools especially. We do! Mums and Kisses makes hundreds of Homecoming Mums per year. We even sell our custom supplies in our store in Crowley, Texas but there are several homecoming mum makers to choose from. Choose who you like and who you’re most comfortable with to do a good job. Look at the quality of their work, their reviews, their prices and their website. You’ll want to choose a mum maker that knows what they’re doing, can work in your budget and if they’re not in your area make sure they ship. Check and see when your school’s homecoming date is. You’ll want to allow yourself about 2 weeks if you’re ordering a mum or garter from a professional or making one yourself. You’ll need time to find all the supplies and a professional will need time to make it and get it to you. Remember, you don’t want to set out the week of homecoming for a mum, supplies will be sold out in your area and mum makers may turn you down for ordering if you don’t give them enough time to make one. AND… you’ll save money if you don’t have to pay rush fees or overnight shipping. Mum makers start taking orders in July, some offer discounts for orders before Sept 1st. If you’re not sure if your child will even go to the game homecoming night, they’ll still want one for the school day, parade and if there’s a dance as well. Thank you for reading our little beginners guide to Texas mums, we hope it helped! One of the top reasons first time parents call year after year is because they either don’t know where to start the mum process or they literally sent their kid to school with a basic premade non decorated mum and came home from work to a crying embarrassed kid and a wadded up mum on the floor. After years of hearing the upset in the voices of these parents it was time to have the team write a beginners guide. If we can prevent even ONE child from an upset at school, then we’ve accomplished something. Mums are a social thing to many, and a status symbol to some. Being a Freshman is hard enough with out having a mum melt down at the beginning of the school year. 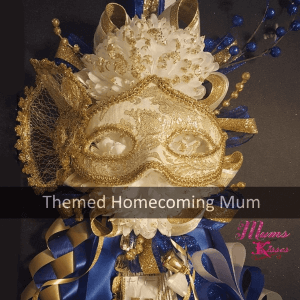 The Mums and Garters For Homecoming – A Beginners Guide to Texas Mums is meant to help, even if just a tad to get a first time parent started. I wish there had been something like this around when my oldest was a freshman. I feel their pain every year, so if this small guide can help a grandparent, a mom, a dad, a family just moving in to the state. Then to me, we’ve helped, and that’s what it’s all about in the end, the kids. I just love ’em. I can’t help it! Our Best Value $79.95 Click Photo To Customize! 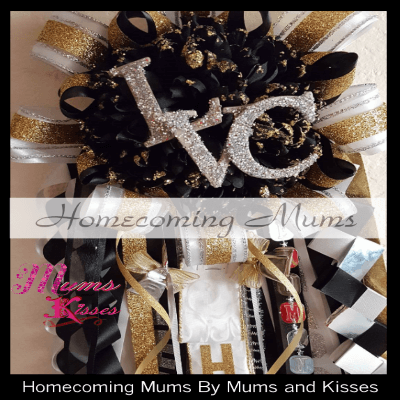 Mums and Garters For Homecoming – A Beginners Guide to Texas Mums an original article by Mums and Kisses distributed by the Hart of Gonzalez Group LLC.